In this Weekend Planner: festivals, festivals everywhere! TIFF may be headlining your to-do list, but don’t miss out on the abundance of veggies and music! Plus, a nerd-themed flea market, acrobatic training, and Toronto remembers 9/11. Hanging high in the sky with the Centre of Gravity Circus Training Studio. Photo courtesy of Elizabeth Connors. FOOD: How do you a) save the environment and b) keep your body at its glorious peak? Twenty thousand food lovers know the answer. The annual Vegetarian Food Festival returns to the Harbourfront Centre with live cooking demonstrations, music, and speaker panels. And food. Did we mention the food? Harbourfront Centre (235 Queens Quay West), Friday 4–9 p.m., Saturday 12–9 p.m., Sunday 12–7 p.m., FREE (food extra). MUSIC: Good music, keeping youth engaged in their community, and making noise against violence? You couldn’t ask for a more winning combination. Scratch (of the Roots) joins hip-hop up-and-comer Reema Major and the Toronto steel pan group Souls of Steel Orchestra for the 2011 urbanNOISE festival. Besides the musical performances, youths will also create a giant mural in remembrance of those who lost their lives due to violence. Albion Library Parking Lot (1515 Albion Road), Saturday, 3–8 p.m., FREE. SPORTS: Women on wheels. Hit. Hard. The Toronto Roller Derby returns with a doubleheader blowout! Come join the action as TORD embraces its new venue in a night of speed, body-checking, and bruises. Fun for the whole family! The Bunker (40 Carl Hall Road, Studio 3), Saturday, 5 p.m., $12 advance, $18 at door. GEEK OUT: Anime and sci-fi fans rejoice! The Friends of the Merril Collection is holding a flea market of sorts for collections of DVDs, books, costumes, comics, and oh so much more. Here’s to hoping sad Darth Vader doesn’t need to sell off his black digs. Because seriously. He’s sad enough. Toronto Reference Library (789 Yonge Street), Saturday, 10 a.m.–4 p.m., FREE. 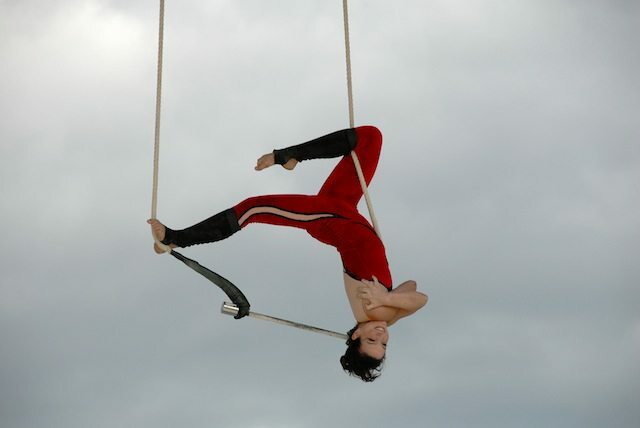 CIRCUS: Do you remember that childhood dream you had of running away and joining the circus? Well, here’s the next best thing. Centre of Gravity Circus Studio West is having its grand opening and it’s inviting the whole family out to celebrate. Expect acrobats, stilt walkers, workshops, and an opportunity to get a behind-the-scenes look at what goes into making a circus show. Centre of Gravity West (213 Sterling Road, Unit 100), Saturday and Sunday, 1–4 p.m., FREE. 9/11: Everybody remembers where they were 10 years ago when the planes hit the Twin Towers. For many, the weekend looked just like this one. TIFF was rolling out its red carpets, pulling off a flawless festival—and then the news. For those lost in the crashes and its aftermath, and for anybody who lost somebody that day, Community Centre 55 will be hosting a memorial observance in the Beach area. Millennium Garden (southeast corner of Coxwell and Eastern Avenue), Sunday, 1 p.m., FREE. TIFF: Finally, have you been following our coverage of TIFF? To name a few features, there’s our survival guide, interviews, and review roundup. Yes, we’re watching Nicolas Cage movies so you don’t have to. Thank us later. TIFF runs September 8–18.